The FWD Drag Series at Santa Pod Raceway is the ultimate test of tuned front wheel drive cars. The FWD Drag Series is a full MSA sanctioned Championship for FWD cars from 4 to 6 cylinders, drivers go head to head in elimination Drag Racing competition against the best European and Japanese cars the UK FWD scene has to offer. Full details on the How to Enter page. 2019 will be the 7th year of the FWD Drag Series, run over 6 events at Santa Pod Raceway. The first season of the FWD Drag Series in 2013 following the merger of JDS FWD, ESC Street & ESC Pro was a huge success, it surpassed all expectations and produced some very exciting racing with many record breaking runs. Keil Priestman won the championship, Richard Batty ran the first UK FWD 8 second pass and Tom Barnes set a World Record for a New Mini. 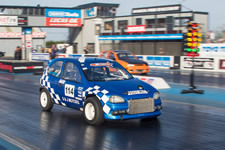 The 2014 Championship was won by Sam Bolton and Robert Johnston who raced their Tigra as a team, Richard Batty was runner-up for the second year running. 2015 saw Glenn Robson take the title with a race to spare ahead of Paul Atkinson. In 2016 Allan Duthie was champion in his first season and in 2017 Paul Atkinson finished the season in the number one spot after two years as runner-up. In 2018 Phil Reeves took the title in his second season and became the first Ford racer to win the championship. There is a Facebook group for the FWD Drag Series at www.facebook.com/groups/FWDdragseries. This is an ideal place for racers, fans and tuners to discuss drag racing with Front Wheel Drive cars.